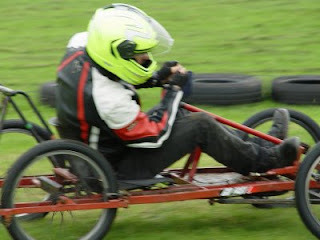 Team Weasel represented the Scottish Cartie Association at the Cumbria heat of the Screwfix Go-Karting Rally earlier this month and came away with a surprise win and a place in the finals near Stirling next month. They were competing against a very strong field including the current and previous SCA Champions (Alford and Rooket), Cairngorm Mountain, Centa Bavaria, Tickettyboo and Team Caiman to name but a few, but despite their high tech, streamlined designs, the SCA Bandit was untouchable all day in the tricky, cold, wet and windy conditions and posted the fastest time in each of the three runs. Team Caiman and Blue Cow also qualified for the finals, and will be taking on C12, Where's me Spanners and Black Dog and a few others who qualifed in other heats. It promises to be an interesting day! Submitted by scottishcarties on September 13, 2011 - 13:17.